Mastering the importing/exporting business, Marks’ talent for duping the border protection rivals Cheech and Chong in Up in Smoke. His quality control trips to Pakistan are entertaining, his zany dealings with Irish drug trafficker and member of the Provisional IRA Jim McCann (an amusing David Thewlis) are comical, and his liaisons with second wife Judy (Chloë Sevigny) are naughty enough to make any married couple envious. This may be the UK version of Blow, minus the coke of course. When the need for Marks to exist under the radar arises, he steals a stranger’s identity, giving Marks his affable moniker, Mr. Nice. Of course Marks’ crime doesn’t go unnoticed (it never does in these movies), and his renegade ethics guide his decision whether or not to become an informant. Depending on where audience’s principles lie, they may be hoping for contrary outcomes, but most will want to see what kind of deal Mr. Nice ends up with. 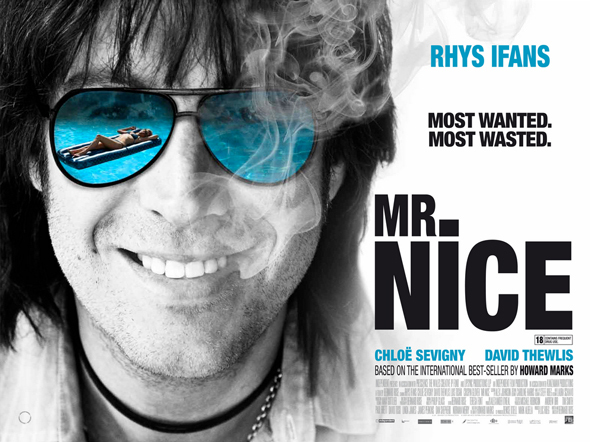 Mr. Nice, written and directed by Bernard Rosem and starring Rhys Ifans, Chloe Sevigny, David Thewlis, and Jack Huston opens in select theaters June 3.